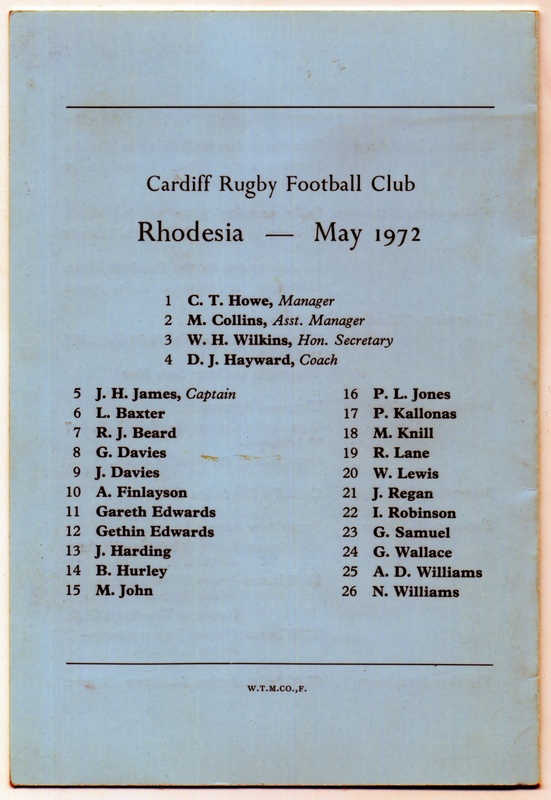 Prior to the club embarking on a tour to Rhodesia there had been a few public protests at Cardiff’s acceptance of the invitation, because of the existence of Rhodesia’s unilateral declaration of independence. 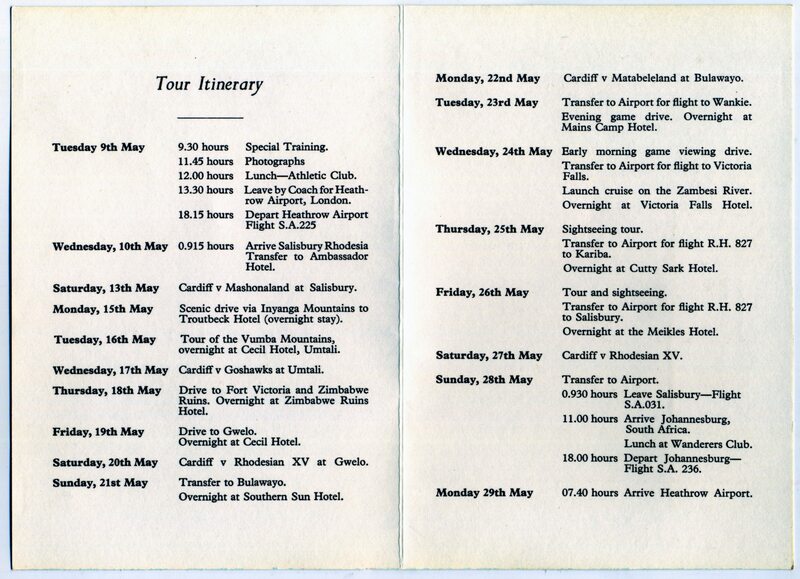 But having been given the go-ahead authority of the WeIsh Rugby Union, and in the sporting interest of Rugby football, the tour, with its very interesting itinerary, was carried out, and turned out to be a very successful one. All five matches were won, including the test with Rhodesia itself at Salisbury, where Mr. lan Smith the Prime Minister was present to see a Cardiff victory by 24 points to six. The Rhodesians were delighted with the display of some great Rugby by Cardiff. Records were broken, Mashonaland were beaten by the highest score in the clubs First XV history, 74 points to 3; Mervyn John scored a try in each of the five matches, seven in all and was top scorer, exceeding the four of Gareth Edwards, Roger Lane and Neil Williams. Our young army full-back John Davies kicked sixteen goals and notched a try. 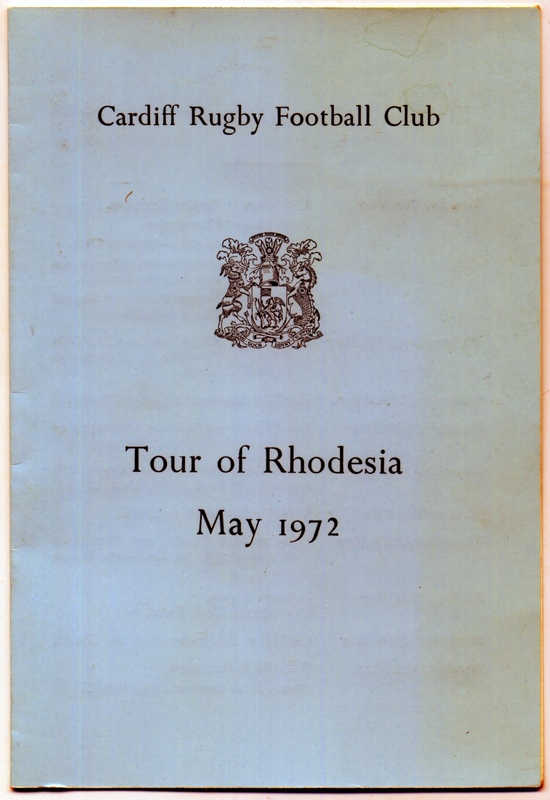 Amongst the many items of hospitality, the reception by the Cambrian Society, the Rhodesian Breweries Ltd. and factories in Salisbury, two days at Troutbeck in the Inyanga Mountains, the Zimbabwe Ruins Hotel, flights to Victoria Falls, the Wankie Game Reserve and Kariba Dam, these indicate the generous welcome of the Rhodesians. Photographs and plaques are housed in the club’s museum. Cardiff’s official party consisted of four officials and twenty-two players, they were : Colin Howe, manager; Malcolm Collins asst. manager; D. J. Hayward, coach; Haydn Wilkins, secretary. The players : Garry Davies, John Davies, Lyn Baxter, Roger Beard, Gareth Edwards, Gethin Edwards, Alec Finlayson, John Harding, Bernard Hurley, John H. James, Mervyn John, P. Lyn Jones, Roger Lane, Wayne Lewis, Phil Kallonas, Mike Knill, John Regan, Ian Robinson, Gary Samuel, Gerald Wallace, Neil Williams, A. D. Williams. Our supporters, headed by Tom Holley, included Messrs. H. Johnson, H. Richards, hon. surgeon and club doctors J. Naysmith and H. Evans.